London : Constable & Co., 1927. Folio, gilt-lettered blue buckram (spine faded, one corner slightly bumped), top edge gilt, 45 leaves of plates with accompanying title leaf, each a fine photogravure reproduction of a Norman Lindsay etching, occasional foxing. 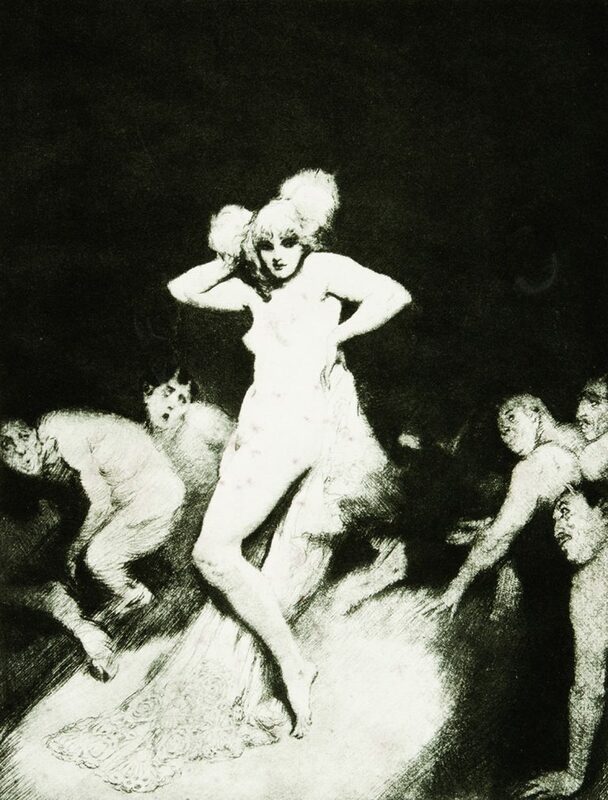 Limited to 129 copies of which 120 were for sale, signed and numbered by Norman Lindsay. A de luxe edition of 31 copies with the original etching 'Your Fate' was also issued. The etchings of Norman Lindsay, published in lavish large format, was admired by Lindsay himself 'as a facsimile perfect as reproduction can be' (from a 1938 letter to Andrew Watt), and '[it] remains one of the most tantalising collections of his work' (BLOOMFIELD, Lin. The complete etchings of Norman Lindsay, Odana 1998, p 65). Lindsay's popularity in the 1920s had risen meteorically, so that the very restricted print run of only 160 copies over two editions fell far short of the market's demands. The book sold out a month prior to publication, dissapointing many prominent collectors including Howard Hinton in New England. Only a handful of copies made it to Austraila, due to it selling out in London, as well as the fact that Australian customs held the two copies sent to Gill's Fine Art Society on the grounds that it was an immoral publication. Bloomfield notes that many copies have been broken to sell the plates: as early as 1938 the reproductions were selling for 21 shilling each, prompting her to observe that 'The Etchings of Norman Lindsay has become the rarest of any of Norman's books'. This statement is supported by a quote from George Mackaness, who wrote in 1965: '... within my knowledge only one copy of this has ever appeared in any Australian or British bookseller's catalogue or at auction'. A handful of copies have been sold since then, but The etchings of Norman Lindsay remains one of his most sumptuous and rare large scale publications.